I used it for the door deadening. With moderate hardness, it also follows the shape of the panel. Unlike Butyl it is easy to handle. This review is about item#9939675. I used it for the setup of the car door speaker from long ago, and I am not dissatisfied with the product itself. However, the opening of the recent door was small, and the impact bar was passed, and the workability worsened. It is disappointing that I could not affix it to the iron plate part of the door as I expected. This review is about item#09939675. It is saved if you can choose thick type and dimension a little wider type etc. There are places where uselessness is spared in the use dimensions, so there are possibilities that there are few places to waste if there are wide objects. Demio DY's original door speaker (front and rear left and right) was replaced with KENWOOD's KFC-C162. In addition, Alpine baffle board KTX-Y 161 B was also installed on a genuine plastic mount. Looking at the genuine speaker removed, the urethane sheet is stuck on the back side and the surface and some vibration suppression processing is done. When improving the audio acoustics this time, I bought a soundproof sheet of aemon for the purpose of effectively suppressing vibration and absorbing irregular reflection of sound. I used it for the clearance between the plastic door of the front door & rear door and the baffle board, the gap between the baffle board and the speaker attachment part. 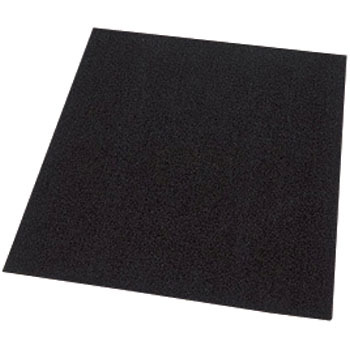 Normally it sticks around 15 mm of anti-vibration sponge of narrow width circumferentially, but since this product is large size about 500 × 450 mm × 5 mm in size, it is hollowed out according to the external size of the baffle board and the speaker, It can be manufactured as one packing board. We made 4 front parts and 4 rear parts and stick to the body of the back of the speaker (such as the outer panel inside the door etc. ), which can be made at the time of holing, and used it for vibration prevention of resonance by the resonance. Although the price of one piece is expensive as 1,427 yen, I think that the suppression effect such as sound leakage, chattering noise due to resonance, sound clogging, etc. is fully demonstrated when compared with an inexpensive anti-vibration sponge. Because the price of one piece is expensive, it can not be used here and there. Amon's god! Please make it a little cheaper!